How can you not make barbecue with something that’s smoky date? 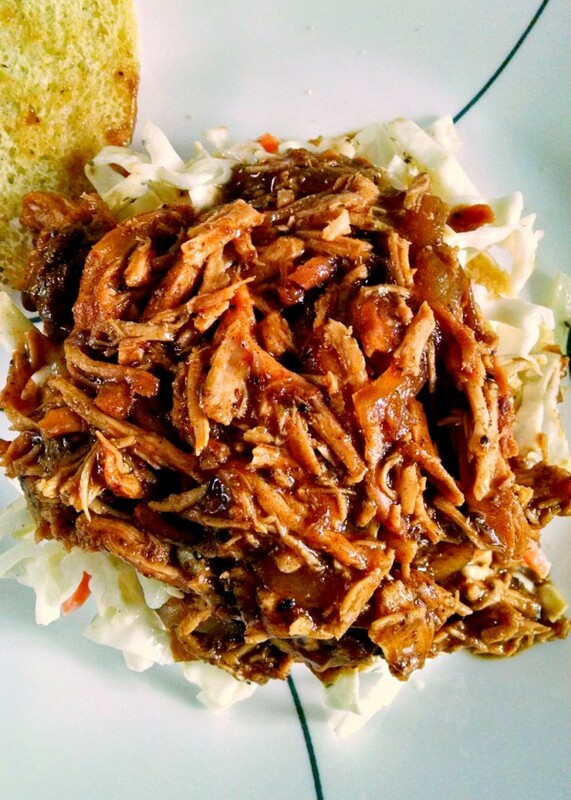 I think it was the smoky part that convinced me I needed to make Slow Cooker Smoky Date Barbecue Sandwiches. +Not Ketchup sent me a bottle of their Smoky Date sauce. How can you not make barbecue with something that’s smoky date? 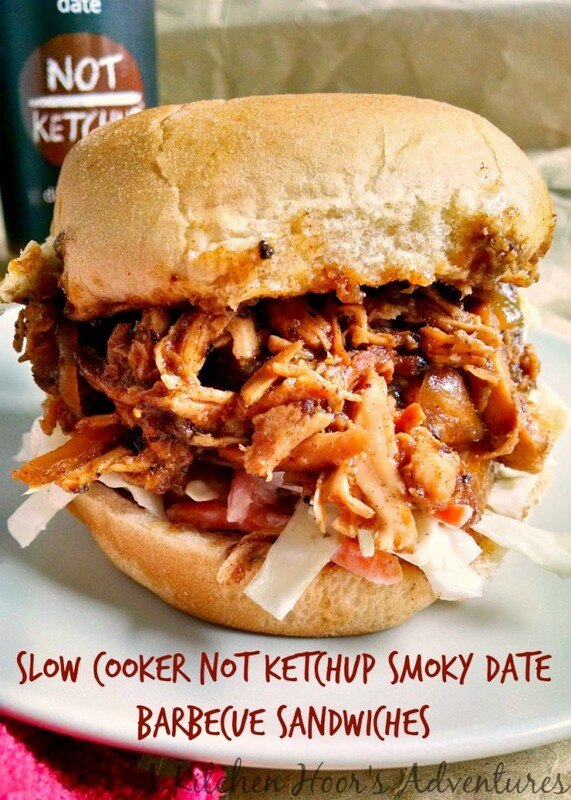 I think it was the smoky part that convinced me I needed to make Slow Cooker +Not Ketchup Smoky Date Barbecue Sandwiches. And it was worth it. SO worth it! Oh yeah, baby. Grab a towel. These are messy good. I wanted to drink the bowl of sauce. Honestly. The smoky date, the flavors of the spices, a little added sweetness from the honey and tang from the cider vinegar really made for a delicious sauce. I leaned a bit towards the Kansas City style sauce with the celery seed. I miss the KC sauce we used to order. Yes, we used to order a CASE of KC sauce because the brand was THAT good. This was THAT GOOD! I wanted to drink the whole bowl. Yes it is worth repeating. Since we can’t grill (cliff dwellers and all) we have to barbecue in the slow cooker. Not that I mind. That just means there’s more sauce for the sammy!! I loves me a saucy sammy. And you’re going to want as much of this sauce as you can get your mouth on! It also helps keep the meat moist in transit to the game for your tailgate party. S couldn’t keep his hands off the meat. Okay. That just didn’t sound right, but he was hovering a nibbling while I was shredding. I was, too, to be honest. This chicken was that good! 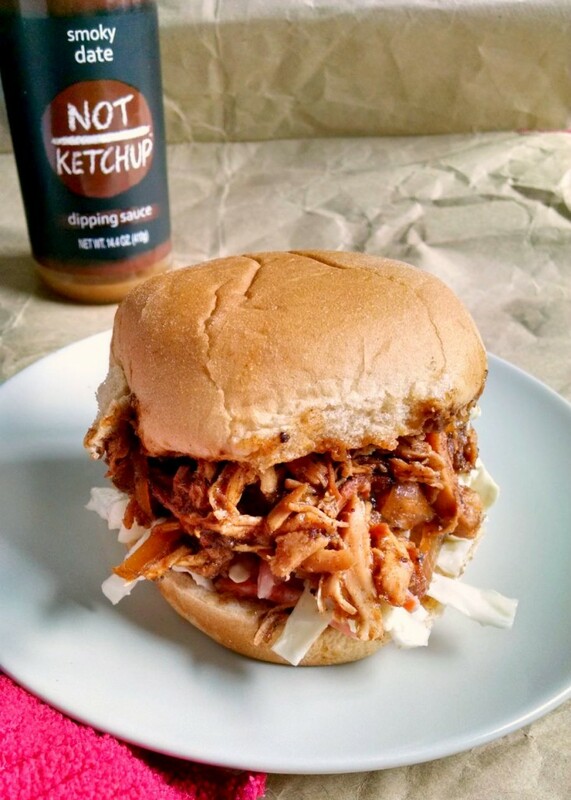 The sweet, different flavor of the Not Ketchup Smoky Date combined with the traditional barbecue flavors made for a really differently delicious barbecue sauce. The date just adds another layer of flavor that your guests will not be expecting! I stopped mid shred to take this. Honestly, you want to grab the chicken and run, don’t ya? It has a nice glaze of sauce on top thanks to the onions that I propped the chicken on top of while it cooked. Yup. I DID over stuff it thank you for asking! I wanted to lick the slow cooker, so this was the next best thing; an over stuffed sandwich. I put a small amount of coleslaw on the bottom. I’ve never done that with a sandwich before. My coleslaw is usually just served on the side, but for stage presence I put some on the bun. It actually was pretty darn good! I may have to try that more often. Just look at that dark, delicious color! I honestly can’t say enough how delicious this chicken is. Thank you +Not Ketchup for sending me this bottle of heaven to make this chicken with. I will definitely be on the lookout for your sauces in my stores! The other flavors sound fabulous, too! There’s Blueberry White Pepper, Cherry Chipotle, Smoky Date, and Spiced Fig. I know. I was the same way. Which to pick? The ideas are just flooding in, aren’t they? Yes, this was a lunch I was excited to have the next day. I believe it even attracted co-workers! How could it not? It smelled amazing when I heated it up. I did the coleslaw thing again. It added nice crunch to sandwich. I highly suggest making a large batch of this chicken and saving some for yourself for later. You will thank me for suggesting this. I’m drooling. Aren’t you drooling? I’m definitely drooling. These are going to be the highlight of your tailgating experience. And I’m not just saying that because it’s my recipe. I’m saying that because it’s true. The aftermath of dinner. The WELL used napkin. I almost licked the plate. I’m not ashamed to say that. I’m a foodie! When something is THIS good, I’m going to let ya know. I ALMOST licked the plate. Make sure you head over to +Not Ketchup and check out their website. I’m following them on Facebook, Twitter, Google+, Pinterest, and Instagram. I highly suggest you follow them, too. You don’t want to miss a new recipe with their luscious sauces and you definitely don’t want to miss any new flavors they introduce! Don’t forget to enter the giveaway with fourteen prize packages! How can you not make barbecue with something that's smoky date? I think it was the smoky part that convinced me I needed to make Slow Cooker +Not Ketchup Smoky Date Barbecue Sandwiches. Arrange the onions in the liner of a slow cooker coated with cooking spray. Place the chicken breasts on top and sprinkle with salt and pepper to taste.
] through cumin) in a small mixing bowl. Pour the barbecue sauce over the chicken and cook on low 8 to 10 hours or until the chicken is fork tender and easily shredded. Remove the breasts from heat and cool slightly. Shred the chicken using two forks. Return the chicken to the slow cooker and stir to combine. Continue to cook until the chicken is reheated. 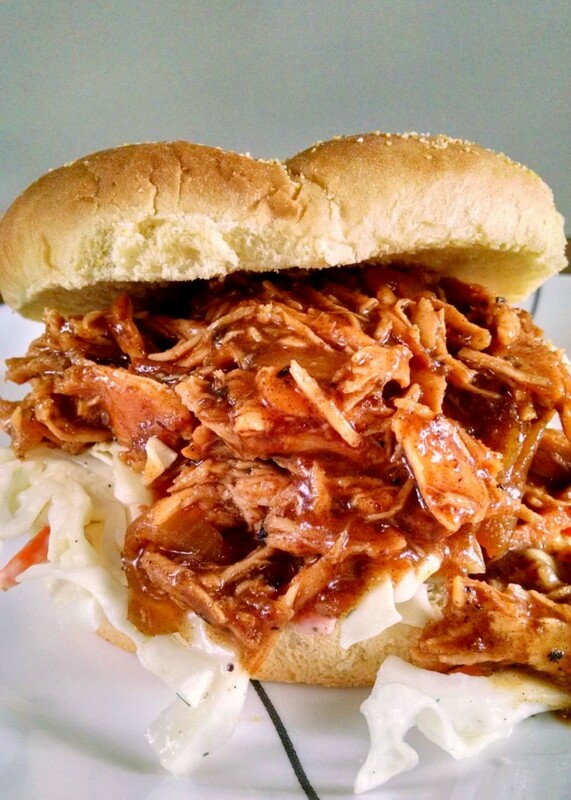 Place 2/3 cup barbecue on top of each of 8 buns and serve with your favorite coleslaw, beans, and other game day side dishes. That not ketchup stuff pairs so well with bbq! I love a good crockpot recipe. This sauce looks fabulous! Thanks! Me, too, Lauren! We use ours at least one a week. That's the flavor I want to try next, Wendy! I love chipotle, but wanted to step outside the box with the smoky date. Yours looks #droolworthy! It was fabulous, Erika! Thank you for sending me the bottle to cook with! I can't wait to try them all. Hmmm…guess it worked. Okay. These look amazing! Thanks for sharing with #10DaysofTailgate. I got the Smoky Date, too. I'll put this on my to-do list. GA won! While I'm not a dogs fan, my cousins are. We are Bucks fans here, in football that is. UK ALL THE WAY for basketball. Thanks for dropping by and commenting. Thanks, Rebekah! You will need a wet wipe for sure!